For each pick I will write a brief analysis of the team’s situation and of course the player selected. I will also put down an alternative pick for each team (of the players still available). Lastly, I will predict the likelihood of each team trading up or down from their spot, and score it as a percentage (there are never any certainties so percentages will start at 10%, equating to ‘next to no chance’. 10-25% represents a slight chance. 25-50% represents some chance. 50-75% indicates a good chance. 75%+ indicates a more than likely chance. I’ll also use stones instead of pounds when measuring players, as the majority of readers will be from the UK. 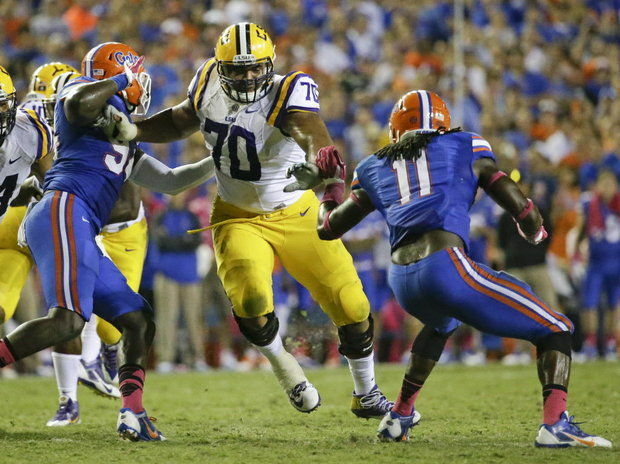 The Pick: La’El Collins, OT/G, LSU. Some mocks are projecting Minnesota taking a wide receiver with this pick but it would be much more wise to protect their young sophomore quarterback and allow him to throw to what he has rather than let him take the same amount of sacks as he did last season (even if some were on him). Cordarrelle Patterson was not effective last year but he still has some potential and Greg Jennings still has a year or two left in him. The Vikings allowed the fifth-most sacks in the NFL and even though they had to do without Adrian Peterson, their rushing attack finished in the bottom half of the league. That is why the Vikings take La’El Collins, who projects well at guard and could probably take over immediately at tackle at some point in his career. Collins looks more suited to tackle than other top-rated lineman Brandon Scherff but the Iowa product looks like he could have a better overall career as one of the top guards in the NFL. The 6’5 Collins played as a freshman at LSU against some fierce competition and took snaps in seven games at left guard. In his sophomore season he became the starting left guard and earned an Honourable Mention from the Associated Press. Collins then made the shift to left tackle as a junior and was just as productive, achieving 65 knockdown blocks (to 64.5 the year before) and earning second-team All-SEC honours. Collins is in his prime when blocking the run. He is aggressive and a mauler with long arms. Being lighter than most lineman at 22 stone he was able to be one of LSU’s quickest lineman off the line at the snap, allowing him to engage rushers quickly and reach the second level. Collins squarish frame that makes him look better at guard is part of what hinders him in pass protection, along with his sometimes over-aggressive actions. When Collins engages his opponent it is tough for them to beat him but his poor balance and inconsistent technique can lead to problems – chiefly his hands going too low due to lunging, leading to defenders switching over the top of him. He struggles against speed rushers in particular. As a three-year starter at LSU Collins has a real wealth of experience and against top competition too. He showed up well against good pass rushers rushers in this draft like Dante Fowler and Alvin Dupree. He will improve the Vikings’ offensive line immediately at guard and if needed move to tackle later in his career if he improves some of his technique. At this point however it is difficult to imagine Collins as a talent at left tackle at the next level but on the other side he could have some success. The Vikings should have success with him in year one regardless. If they avoid Collins they are most likely to avoid the line altogether and choose Bridgewater’s former team-mate DeVante Parker to be a potential number 1 receiver. Alternative pick: Devante Parker, WR, Louisville. 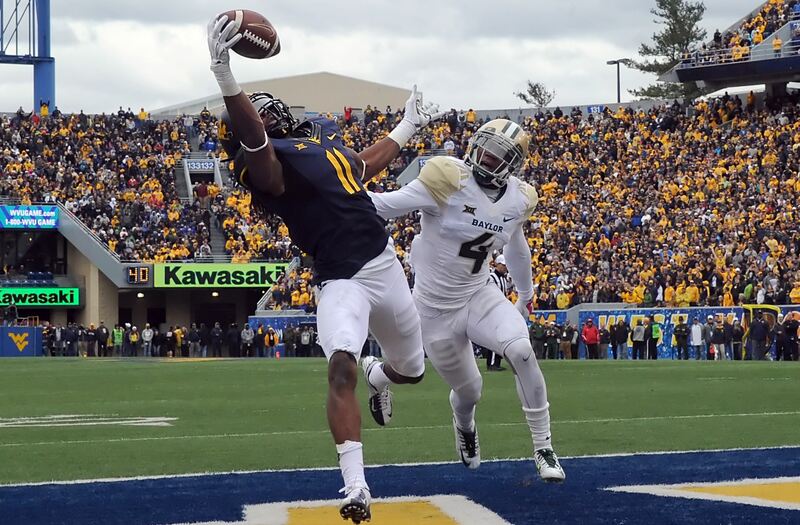 The Pick: Kevin White, WR, West Virginia. The Cleveland Browns could use help in a few places and they will be able to address two of them with two picks in the first round. Their trade with Buffalo last year gives them the 16th pick in this draft too. Cleveland could use the extra pick to trade up but it’s questionable as to who would be worth trading up for. The Browns need help on the defensive line and at linebacker. The offensive line could be upgraded but they might look for someone in free agency or wait until the second round. Keeping Johnny Manziel or whoever is at quarterback on two feet will be on Cleveland’s to-do list. The Browns though are in dire need of a wide receiver and they take the best one available in Kevin White. Even before Josh Gordon ended up embroiled in another drug scandal the Browns would have needed a receiver at some point but now it is their top priority. There is a very good chance the Browns opt for Devante Parker but White seems the better player. Cleveland will take the West Virginia talent despite White ironically raising some character questions by declining an invite to the Senior Bowl. There’s no doubting his ability though and at 6’3 he is a couple of inches taller than Amari Cooper; some will argue that White is the more exciting prospect. He has an ideal frame and weight of 15 stone that will allow him to make contested catches. White went for 507 yards off of 35 catches with five touchdowns in 2013 before exploding for 1,447 yards in the last season. He was named All-American and was a finalist for the Fred Biletnikoff Award. White runs good routes and has a knack of getting open and will always try to take the ball at the highest point. He will always work to gain yards after the catch but he lacks the moves to consistently make defenders miss – instead he will try to push his way forward almost like a running back. White takes long strides that are good for after the catch but his lack of elite speed means he relies more on space and blown coverage to go for big chunks of yardage. His 13.3 yards per catch average is lower than that of Cooper and all the top receivers in this class (Devante Parker, Jaelen Strong and Dorial Green-Beckham) but his ten touchdown catches prove he is a reliable threat (of the top prospects, only Cooper (16) had more while Strong equalled White’s endzone grabs). He will need to improve slightly as a blocker at times to be considered a complete player. 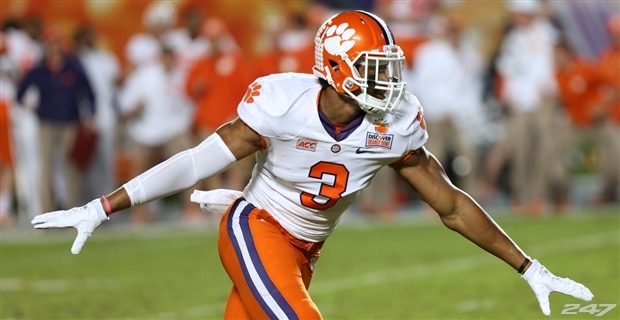 The Pick: Vic Beasley, DE/OLB, Clemson. The Saints disappointed us this year – and that includes legendary quarterback Drew Brees. There were rumours that New Orleans would look for his replacement this year and his age increases and his effectiveness goes the other way. Such a move would not be wise due to the prospects left on the board and the fact that the Saints are too far back to trade up. Brees still has a good year or two left in him if things improve around him and the defense could also use some help. Beasley is arguably a top-ten prospect and if he falls here then the Saints would not and should not pass him up. Beasley tallied 11 sacks this season before adding another against Oklahoma in the Russell Athletic Bowl (scouts love players that perform in the big games). He had an explosive start to the season but faded midway through the campaign – going five games without a sack. He picked up towards the end of the season but it will be interesting to see if Beasley is one of those players whose production dips and rises. He received All-American honours in 2013 after totalling 13 sacks and in 2014 he was solid enough to merit honours again. Beasley is extremely quick at the snap and is athletic enough to manoeuvre his body into positions to pull down a QB like few others can. He has good hands that will cause damage against blockers and he is also good in pursuit, using his speed and instincts to track down the ball (seven forced fumbles in his career). His speed doesn’t exactly make up for his physical deficiencies but he is explosive enough to be very useful in New Orleans against the shaky offensive lines in the NFC South. At 6’2 and over 16.5 stone he has okay size but he could do with adding some more beef to his body as he is quite lean, especially in his legs. Beasley struggles at shedding blocks in general and against the run in general – when both are combined Beasley looks very out of sorts and sometimes stop trying. This will lead to questions about whether he plays every down – regardless of it being in a 4-3 defense or a 3-4 defense; how he works in the Combine could determine whether he ends up playing as an outside linebacker in a 3-4 or a defensive end in a 4-3 in the NFL. If the Saints take Beasley he should fit in as an OLB in Rob Ryan’s 3-4 defense, arguably the safest bet. New Orleans dropped from fourth to 31st in yards allowed last year but have a lot of cap room so they could bring in someone like Brian Orakpo and allow Beasley to add some bulk and develop his overall game in 2015, contributing mostly as a third-down player thanks to his penchant for big plays for big losses. 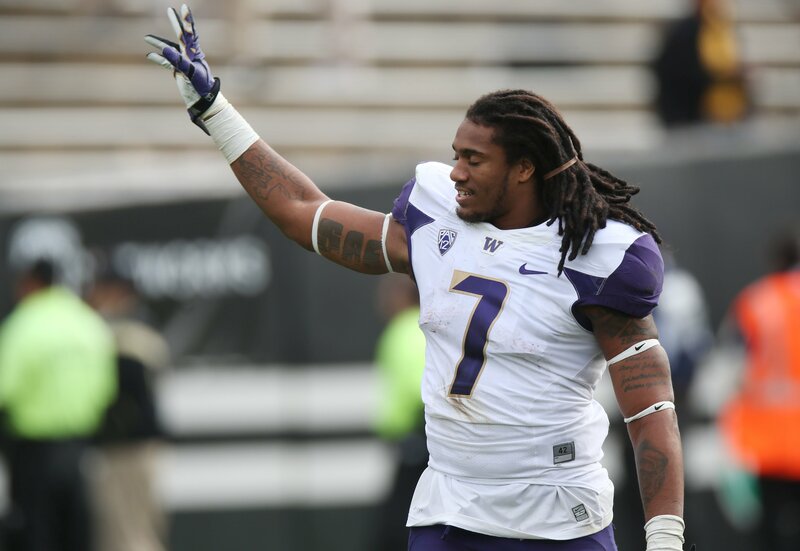 Alternative pick: Shaq Thompson, OLB, Washington. The Pick: Shaq Thompson, OLB, Washington. There hasn’t been any sort of consensus for Miami’s choice here. Wide receiver Mike Wallace looks to be on his way out of town (maybe to the benefit of both parties). The running back situation could be strengthened because even though Lamar Miller went for over 1,000 yards – for the first time in his career – he could use a buddy. The offensive line isn’t great either. However, in a division that has uncertain quarterback situations (the Jets and the Bills) and an aging (but still pretty amazing, mind you) Tom Brady in New England, the Dolphins could use a pass rusher to create some havoc and linebacker is a position of need. The Dolphins ranked tied 16th in sacks in the league but star defensive end Cameron Wake could use some help as he ages (he’s 33 now). The effectiveness of the defense as a whole dropped off towards the end of the season. Thompson is 6’2 and 16.5 stone so he is not quite the ideal size for an outside linebacker in the NFL. What this size has given rise to however is an ability to play multiple positions: Thompson has played at safety and even shone at running back. He also took snaps at inside linebacker against Stanford in 2014. While it’s unlikely he will line up on the offense, his knowledge of how to play the position means he will good at gaining return yards on forced fumbles and interceptions. Thompson forced three fumbles in 2014 and scored three touchdowns on fumble recoveries. In 2012 he gained 21 yards off his solitary fumble recovery and he returned an interception for 36 yards and a touchdown last season, as well as returning one for 80 yards and a score in 2013. In terms of sacks, Thompson hasn’t been in the same league as the Vic Beasleys and Shane Rays. In 2012 when he lined up as a defensive back primarily, he recorded two sacks. In 2013 all he could muster was half a sack. He recorded a single sack this year. Thompson recorded 81 tackle this past season and 233 in total over his career, including 15 for a loss. Thompson is too small to start every down in the NFL at this point as a linebacker. He can be bullied by guards due to his size and while he has long arms, they aren’t effective enough yet technically to consistently help him beat linemen. Building up his strength will help turn this around in addition to good coaching. Thompson has good football intelligence thanks to his positional versatility and he also has a strong work ethic. With an average of 7.5 yard per carry and 456 total yards as a running back (and two touchdowns), Thompson could be use as an emergency backup at the position, something Miami could certainly use. He plays well on special teams and could contribute here right away. If he plays as a 4-3 outside linebacker, these coverage skills will be very important from the outset and could lead to playing time on certain sub-packages in his rookie season while he adds more beef to his frame to develop into a premium pass rusher. Miami can solve it’s receiver and running back problems later in the draft (the latter could also be addressed in free agency). Alternative pick: Alvin Dupree, DE, Kentucky. The Pick: Jaelen Strong, WR, Arizona State. The 49ers need a receiver – that much is certain. Michael Crabtree has been off his game for a while and hasn’t been a true threat since his return from injury (plus there’s no guarantee that he’ll even be in the Bay in September). Anquan Boldin isn’t getting any younger and has his limitations. Stevie Johnson wasn’t what the team hoped he would be. The question is which receiver do the 49ers take if Kevin White and Amari Cooper are off the board? 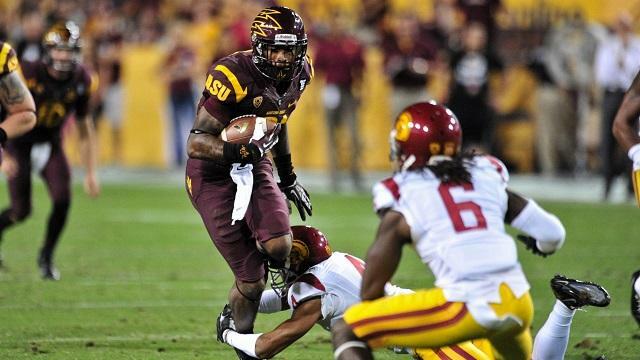 Jaelen Strong should be their choice. Strong lives up to his name and will provide a physical presence on the outside. This puts him ahead of Devante Parker for the 49ers as Parker has missed some games with injury and doesn’t play as aggressively as the Arizona State product. Considering the 49ers will match up against the best secondary in the league in Seattle, another top defense in Arizona and a St Louis outfit that isn’t too shabby either, they will need a tough wideout. All of these defenses play mean and Strong has the frame (6’3 and over 15 stone) to deal with them. Strong will appeal to the 49ers more than the amazingly intriguing but potentially dangerous conundrum that is Dorial Green-Beckham. After an offseason of change and a 2014 littered with conflict, the 49ers could do without more possible controversy (especially considering that takes-no-prisoners coach Jim Harbaugh is now in Michigan). Strong is raw but his ceiling is very high. His physical build is matched by physical play and he is quick off the line. He has the tools to be an effective vertical threat in the NFL – something that has been lacking in San Francisco for a few years now. He is very adept at catching back-shoulder fades on the outside (the NFL’s new craze) and is well-lessoned in catching screens and crossing routes over the middle. Strong’s frame allows him to makes many contested catches. Strong went for 1,165 yards in 2014 and hauled in ten touchdowns in the process. In 2013 he exploded onto the scene after transferring from the junior college ranks (where he excelled) as he caught seven touchdowns and racked up 1,122 yards. Strong’s rawness is what will detract some scouts but in San Francisco he can have a year playing second fiddle to Anquan Boldin as he develops his overall game. While quick off the line, Strong doesn’t possess top-end speed and he can sometimes struggle to achieve separation downfield. Strong could also use his arms better and ensure he is always catching the ball at its highest point. The biggest red flag over Strong is his route running. As a raw product he will need time to improve in this area because he will not survive in the NFL unless he becomes more polished in his routes (especially in the ultra-competitive NFC West). Alternative pick: Devante Parker, WR, Lousville. The Pick: Todd Gurley, RB, Georgia. The Texans could use help everywhere on offense. They need a quarterback if they want to sneak into the AFC playoffs while they could use a receiver to (at some point in the near future) replace Andre Johnson and help DeAndre Hopkins. Arian Foster has had his fair share of injuries and will be a year away from 30 when the season starts. The offensive line could also use some help. The Texans will choose a running back as it will excite the fan base (and the media). There hasn’t been a running back taken in the first round since 2012 (Trent Richardson, who has turned out to be a bust and Doug Martin, who has been oft injured). Todd Gurley is perhaps the most exciting back in the class and pips Melvin Gordon here as the Texans don’t have to throw him in at the deep end with Arian Foster still (just) under 30 years old. The Georgia product stands at 6’1 which is a good inch or two taller than the average running back but he still is a natural at lowering his shoulders and attacking the line of scrimmage. Gurley’s combination of speed and power has drawn comparisons to Marshawn Lynch of the Seattle Seahawks. This is evidenced by the fact that 61.9% of his yardage in 2014 came after the first contact. 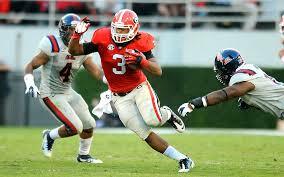 Gurley likes to stay in bounds and finish his runs and is good at making his speed count on the field. He is balanced throughout his body and executes his cuts well. He is a quick and professional mover for someone at almost 16.5 stone. Gurley exploded onto the scene as a freshman as he ran for 1,385 yards and averaged 6.2 yards per carry in the process. He also scored 17 times on runs in 2012 and added 117 yards in receiving. He has soft hands and will only continue to improve as a receiver. In 2013 and 2014 Gurley played banged up. His ACL tear last year will raise plenty of doubts but according to many this won’t affect his draft stock. Gurley was on the way to a memorable season in 2014 with 911 yards off of 123 carries, averaging a massive 7.4 yards a carry and adding nine touchdown scores. His Combine performance (particularly in the 40 yard dash) could determine whether a needy team like Houston take the chance on him – this is indeed if he performs at all. Gurley’s chief red flag is his injury history but teams will also be wary of his inconsistency and lack of experience as a blocker. He could also be a bit more patient at times and improve his field vision. Gurley’s scary potential – coupled with the fact that Houston can be lenient in when he comes back thanks to Arian Foster – means that he will be taken confidently by the Texans. A fearsome running back tandem of Foster and Gurley will aid whoever ends up playing QB next season. Alternative pick: Melvin Gordon, RB, Wisconsin. The Pick: Melvin Gordon, RB, Wisconsin. The Chargers are another team that could help in more than one offensive position. They could do with improving their offensive line and giving Phillip Rivers another target will have to be a factor later in the draft. With Ryan Matthews heading for free agency this leaves the running back position up in the air, although it arguably might still be if he returns due to the former 12th overall pick’s inability to stay healthy. Enter Melvin Gordon. Melvin Gordon makes perfect sense for the Chargers. After a stellar 2014 in Wisconsin where the Heisman Trophy candidate rushed for a monster 2,587 yards and 29 touchdowns, Gordon has projected himself as a possible star at the next level. He averaged 7.5 yards per carry last season after averaging 7.8 over the course of 2013, where he ran for 1,609 yards. Gordon’s ability as a receiver improved in 2014 and has led to comparisons with Kansas City Chiefs running back Jamaal Charles. He compiled 153 yards on 19 receptions and was able to catch three touchdown passes. Gordon is nifty in the open field and has good moves. Gordon’s balance is particularly lauded as is his acceleration. His long strides help him to reach the house on runs. While Gordon accelerates very quickly, he doesn’t have flat-out top-end speed. He also isn’t as much of a bulldozer when it comes to riding tackles as Todd Gurley is but he nonetheless is proficient when moving against blockers as he lowers his pads and uses his well-rounded body to push forward. Gordon will need to continue to improve on his catching abilities as he could’ve added plenty of more yards to his total if it weren’t for drops and such. Gordon’s chief struggles as a runner relate to his tendency to want to bounce outside due to that being where the gaping holes were for him in college – it won’t be like this in the NFL and he’ll need to raise his game as an inside runner. Gordon will need to improve in the aforementioned areas to supplant Matthews or Brandon Oliver in third-down situations but he has the ability to contribute on first and second downs immediately. Alternative pick: Ereck Flowers, OL, Miami. The Pick: DeVante Parker, WR, Louisville. The Chiefs need a receiver. Big time. None of their receivers caught a touchdown pass in 2014. That is many things – none positive. The Chiefs offense, led by Alex Smith, finished 25th in yards per game with an average of 318.8 but not even 200 of those yards were passing yards. When you add in the fact that Dwayne Bowe will almost certainly be leaving it becomes apparent that the Chiefs need playmaking pass catchers – and fast. Parker is the best receiver on the board and he will fit nicely in Kansas City. As I said earlier, the only reason San Francisco will pass him up is because of his injury history and that he isn’t quite aggressive enough in press coverage to deal with the tough defenses in the NFC West. He won’t win as many contested catches against the 49ers’ opponents as he will in Kansas City. The AFC West is quite different however and Parker is a great athlete who can take advantage with a good skill set and great physical tools. At 6’3 and almost 15 stone Parker is consistent in securing catches into his body but excels at taking the ball at its highest point. Parker jumps well to do this and always challenges for the ball and so always has a chance of making a play. He consistently pushes for yards after the catch and can achieve this in open space despite not possessing elite quickness. Parker’s lack of burst is a problem and while he always challenges for the ball he is a poor run blocker and he doesn’t sell his routes well if he know he’s not the target. He will have to improve his play against press coverage and his route running in general to be a threat all over the field. Parker averaged almost 20 yards per reception in 2014, showing a penchant for big plays that any team would love to have. He missed the first seven games with a broken foot so only had 43 receptions (an average of 7.2 per game). In 2013 he had 55 receptions for 855 yards and 12 touchdowns. Teddy Bridgewater’s favourite receiver at college can now form a relationship with another first-round QB in Alex Smith. Alternative pick: Dorial Green-Beckham, WR, Oklahama. The Pick: Alvin Dupree, DE, Kentucky. The Cleveland Browns can grab another solid immediate starter with the latter of their two first round picks. It could well be argued that Alvin Dupree is a steal outside the top half of the draft and especially when you conside the deficiencies on Cleveland’s defense he can improve the team right off the bat. Cleveland’s defense ranked 23rd in yards allowed per game in 2014 and 27th in sacks. Above that they surrendered a league-high 141 yards per game on the ground. The only way the Browns don’t fix their defensive line with this pick is if they sign someone lucrative in free agency or address the need with the 12th pick. Dupree is the best player on the board and he will be very exciting to Cleveland fans. 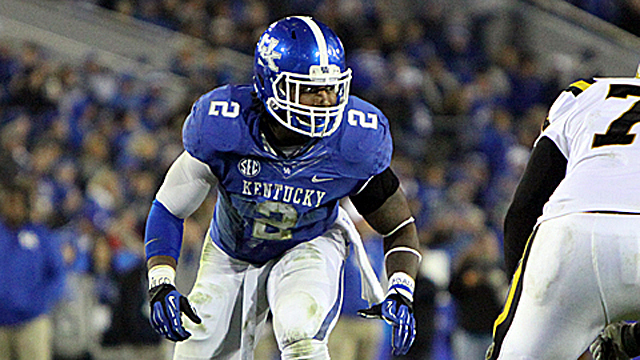 Dupree totalled seven sacks in 2014 and 74 tackles. His junior season saw his greatest sack total of seven and a half through 11 games and the year previously he amassed a career-high 91 tackles. Dupree has huge potential and his ability continues to grow. At 6’4, Dupree has coveted NFL height. He is athletic and can cause many problems off the edge and if Cleveland want to be able to keep up with their rivals that boast top quarterbacks then someone like Dupree has the potential to be a thorn in their side for a decade. Dupree has a very quick initial burst and he uses his arms well to blast past blockers. He is very effective against tight ends. Dupree’s closing burst is something that will entice any team as he doesn’t hold back on his hits on running backs in particular. The Kentucky standout transitions well during plays from pass to rush and is adept at dropping into coverage. He can however get caught out by hesitating and taking bad angles. However, some have questioned his instincts and there is no doubt he is quite raw and will need to add some football strength to play on all three downs. At 18.5 stone and a chiselled frame he could use some extra beef. I’d also raise the doubt that it’s not a definite whether Dupree will be more successful as a 3-4 pass rushing linebacker or a 4-3 rushing end. Overall, Dupree is a very safe bet for Cleveland but he will need to improve his pass rushing instincts and his ability against the run to consistently be effective in the NFL. Alternative pick: Nate Orchard, DE, Utah. 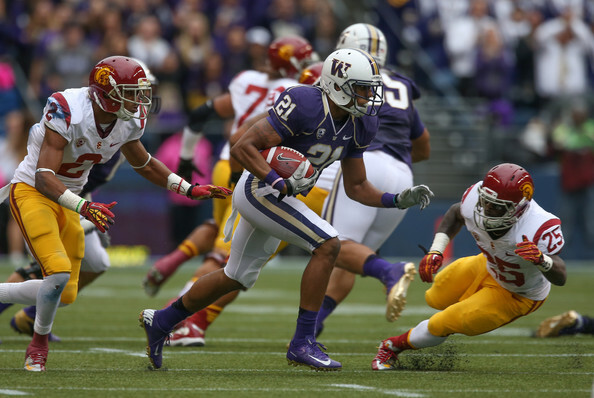 The Pick: Marcus Peters, CB, Washington. The old saying is that you can never have enough cornerbacks in the NFL and the Eagles opt to take one with their first pick to address their dire secondary. There are teams ahead and behind Philly that will be on the lookout for a corner. Trae Waynes is the only certainty to go in round one and PJ Williams would be the other option – but I think the Eagles will choose the electric but eccentric 6’0 playmaker from Washington. Peters has prototypical height for the position and he is quick enough to be successful. He will be one to watch at the Combine. Peters is extremely athletic and plays physical – two imperatives for an NFL corner. Despite his physicality he always remembers to turn back towards the ball to avoid penalties and to try and make a play: evidenced by 20 passes defensed and 11 interceptions over 18 games as a Washington player (more on that low number of games later). Peters is an aggressive tackler but he is sometimes too handsy with receivers which will cost penalties in the NFL. He could also be better in coverage. He doesn’t have elite speed and beats himself up too much – leading to other players beating him. The biggest question marks over Peters regard his character: he was dismissed from Washington following repeated clashes with the coaching staff. If the Eagles do take him they will have to be sure about him during the interview process but a stellar showing at the Combine might make things a little easier for the 13.5 stone corner. Alternative pick: Ifo Ekpre-Olomu, CB, Oregon. This entry was posted in The NFL and tagged alvin dupree, bud dupree, cleveland browns, college football, devante parker, houston texans, jaelen strong, Kansas City Chiefs, kevin white, la'el collins, marcus peters, melvin gordon, miami dolphins, minnesota vikings, new orleans saints, nfl nfl draft, Philadelphia Eagles, san diego chargers, San Francisco 49ers, shaw thompson, todd gurley, vic beasley by ryanrowe. Bookmark the permalink.